One of my main areas of study is Periphyton developed in microcosms. For those of you who don’t know, Periphyton is a green biofilm that you may notice in some (not very clean) swimming pools and is composed mainly of algae, bacteria, fungi, meiofauna and detritus. I started studying Periphyton because my Masters thesis involved developing a model in freshwater systems and after that I wanted to look into their spatial distribution. I wanted to find an opportunity to connect my study system with two of my passions: space travel (I used to watch Star Trek and also I thoroughly enjoyed Space: The Final Frontier for Ecological Theory by Peter Kareiva) and tropical rainforests (which I developed a fondness for while watching Tarzan). I thought I could use Periphyton as a model system to test ecological theory, with a complexity similar to tropical forest as suggested by Lowe . The study of the spatial structure of Periphyton was not as easy as space travel in Star Trek (for one thing they have a warp drive and I don’t!). I wanted to compare spatial models and data, but the methods that were available weren’t very well-suited to what I wanted to do, so I was not sure of how to begin. In the end, I decided to launch my first microcosms experiment and in the first photos I took of Periphyton’s spatial structure I saw they were like clouds, algae clouds. As I knew that clouds were fractals – and it’s only a short step from Star Trek to fractals – I started to investigate. There was one problem, fractals are yes/no spatial structures – binary images – but I had a complex spatial distribution of Periphyton’s biomass. The solution I found was multifractals. These are just like fractals but have an infinite number of dimensions. The mathematical objects that are described by fractals are sets and the ones described by multifractals are measures. Measures are basically things that are “measurable” like densities or probabilities. Thus fractals have one dimension that is enough to characterize it, and multifractals have a bunch of dimensions: the generalized dimensions . Going back to Periphyton, I realized that what I was doing with a camera was the same as what satellites were doing around the earth, thus the same techniques that I developed for Periphyton could be applied to satellite imagery. This was an incentive to polish the software I have programmed, add R interface, and publish it with its own identity: mfSBA. In this long journey into the darkness (a bit like the last Star Trek movie), I started to develop spatial models. 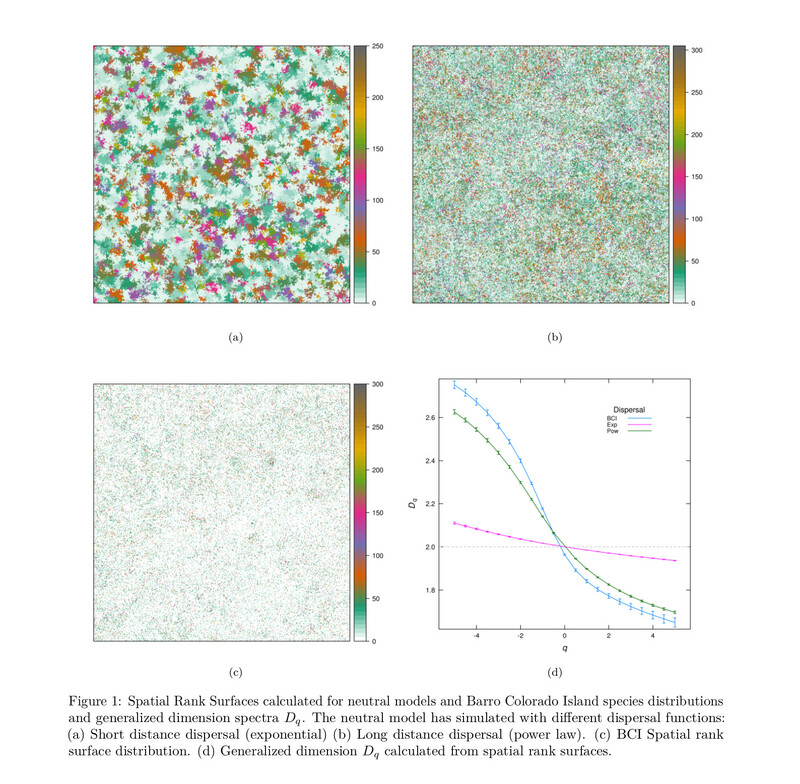 They were mainly based on cellular automata, but stochastic, and then I came across Neutral Theory of Biodiversity. One of the first things I noticed about Neutral Theory is the controversy around it, I don’t think that is a problem of ignorance but a matter of scale. Anyway, the other thing I noticed was that the species abundance distributions (SAD) are not very informative about the processes that generate them. I thougth: what about studying it in space? There are also species-area relationships (SAR), but these are only about the number of species, and don’t provide information on abundances meaning that a lot of information can be lost. There is a third piece in this puzzle: the SAD can be represented as rank-abundance distributions (RAD). RADs are equivalent to cumulative distributions so are a robust way to represent SAD without losing information. So, I wanted to know: how can I combine RADs with SADs to build a kind of warp drive that rockets our scientific knowledge beyond light speed? I thought that between SAD, SAR and RAD, the most important thing I had to do to be different was to build a good acronym! Then I could really begin to move forward. I removed the “D”, but, to keep with tradition, it had to be three letters. I ended up with SRS: Species Rank Surface. SRS is a spatial surface formed by the ranks of the species RAD inside any given area. To build the SRS you first need to calculate the RAD of the species. Then you put the rank of the species in the spatial position of the species. So now we have a surface consisting of the ranks of the species distribution. Below is an SRS example with 64 species, the most abundant species have a 1 as rank, the least abundant species have higher numbers so the peaks corresponds to the rare species. The best way to compare different SRSs is to use the generalized dimensions from multifractal theory. I made simulations with my spatial neutral model using parameters estimated for Barro Colorado Island forest plot (BCI) from the existing literature [2-4] and two different dispersal kernels with the same average dispersal distance. The exponential kernel is representative of short distance dispersal mode and the inverse power law of long distance dispersal mode. With these simulations I can compare the results of the models with the actual Species Rank Surface from the BCI plot. I finally got what I wanted! OK, it’s not exactly what I described in the second paragraph of this post, but I think it’s pretty close (considering what I was trying to pull together). What my methods allows us to do (which several other methods do not) is analyze the spatial pattern of all the species in a given area at the same time. In lots of published papers the most abundant species are analysed one by one, the less abundant species aren’t analysed at all because they don’t have enough data.With SRS we can include them all! In addition we are also taking into account the species abundance distributions. This is not quite warp drive, but it is the closest I can get… for now. To find out more about Species Rank Surface, read the full article HERE. This entry was posted in Meetings, Methods papers and tagged Algae, Bacteria, Ecological Theory, Fractals, Fungi, Meiofauna, mfSBA, Microcosms, Multifractals, Neutral Theory of Biodiversity, Periphyton, R, Rank-Abundance Distributions, Rare Species, Spatial Distribution, Spatial Neutral Model, Spatial Structures, Species Abundance Distributions, Species Rank Surface, Species-Area Relationships, Star Trek, Tarzan by Chris Grieves. Bookmark the permalink.